Would this be a case of “All dressed up and no place to go”? Charles Wallace, who works Hidden Hollow Maple Farm with his father and son, dropped a brief note: ”The sap is finally starting to run! Boiling over the weekend! Mike Hill said he and Ralph were boiling at Valley Road Maple for the first time today (Friday), and recalled that last year they had made syrup much earlier—February 2nd. But they used the time this year to get the pancake house ready – a new griddle and other new equipment to make gluten-free pancakes for those who need them, and, of course other griddles for regular pancakes and sausages. They’ll be seating 77 folks at a time, so plan your breakfast or brunch there. Robin Mahler said that at Mud St. Maple Jeff has been focusing on developing some new products and getting some ready for tomorrow. “We are bagging up some walnuts. And I will be making signs and tagging our newest products, “Infused Coffee maple syrup” and our Mud St. Maple “Sweet Tree Maple” Barbecue Sauce.” This is a come early, stay late site. 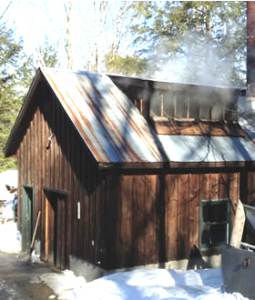 If steam is coming from the sugar shack, stop in. No updates from Adirondack Gold Maple, but at Toad Hill Randy Galusha wrote, “We’ve got plenty of product, and the gift shop is well stocked with new products. We have sap to boil. Been busy in the kitchen. Maple Walnut Toffee, Maple Bon Bons, Maple Frosted Almonds, Cashews, Pecans and Walnuts, Maple Trailmix, Maple Walnut Fudge (smooth and creamy), Whole new inventory of sweatshirts, T shirts, hats and tote bags.” And I saw a great post about some Toad Hill coffee mugs, so be looking for those when you stop by! Bob and Irene Barody will have their certified organic poultry products and Jams and bread, and the many cuts of Non-GMO pork at Blackberry Hill and Sanctuary, so ask about that. With luck you’ll get to meet their two rescued pot-belly pigs, Jack and Diane, who have a “thing” for fig newtons. You might want to bring a few and make friends for life. Note: Blackberry Hill has established a “Pet Food Pantry” to help families struggling to keep pets well-nourished. If you are in need of their help, or if you can contribute pet food to the pantry, do stop in. I was in touch with Sheila Flanagan at Nettle Meadow a couple of days ago, and they’ll have some treats to offer – Peasant bread from Izzy’s Deli, with their own Maple Butter. And you can look for Maple Jackwax goat cheese Ice cream, as well as samples of the NFM’s inimitable mac and cheese with a recipe card to take home. And of course their prize-winning cheese can be sampled and purchased in the shop, along with recipe books. Just down the road at Martin’s Lumber, Wini said the bit of warmer weather melted snow in front of the house and Gary would be knocking down the snow banks to make room for guest parking over the weekend. Her project has been clearing room in the house and garage area for the increased number of guest artisans who will join them for weekends this month – some coming all three weekends, others able to make it to just one or two. This weekend, count on Empty Nest Sud-drome soaps, Diane Cubit’s Pottery, Forest Floor artistry, Lucyann’s paper bead jewelry, Maple Ridge jellies and jams, handcrafted greeting cards and paper ornaments; There will be rustic wooden signs and charcuterie boards, unique wooden shelves, and much more, along with interactive demonstrations and a new round of the “Paper Bead Game.”. So there you have it. Thurman Maple Days, day 1 will be off and running. Bundle up, grab your boots and join the fun! And be sure to post a note on FB page “Visit Thurman Maple Farms” when you get back home. Tell us where you went and what you did!